1- Chinese Super League Better Than You Think: Was impressed by the standard of football displayed in the top of the table clash between Guangzhou Evergrande and Beijing Guoan. It was an engrossing, blood and thunder contest well worth my time. After Beijing Guoan’s Brazilian skipper Renato Augusto had missed a spot kick, it took an injury-time effort from Anderson Talisca to settle the tie in seven time champions Evergrande’s favour. Currently on loan from Benfica, Talisca is providing the fuel for Evergrande’s title charge. He has already bagged 12 goals from 10 matches. 2- Paulinho Loan To Evergrande Barca’s Loss: Ernesto Valverde’s Blagruana rode their luck at Estadio Anoeta to emerge 2-1 victors over a vibrant Real Sociedad this past weekend. Victory gave Barcelona sole leadership of an embryonic Liga Santander table but it doesn’t mask the fact they are missing Paulinho. Brazil’s World Cup midfielder is colossal for Evergrande, providing a work rate that was absent from his replacement at Barcelona Arturo Vidal. Wouldn’t be surprised if Valverde recalls him from his loan spell in China. 3- Ronaldo Hasn’t Improved Juventus: Five-time Ballon D’Or winner Cristiano Ronaldo was received as a messiah when he joined Old Lady from Real Madrid last summer. However, he hasn’t improved Juventus. On the evidence of their display in a 2-1 victory over Roberto de Zerbi’s energetic Sassuolo, I can’t see how they can get past elite sides in the Champions League. 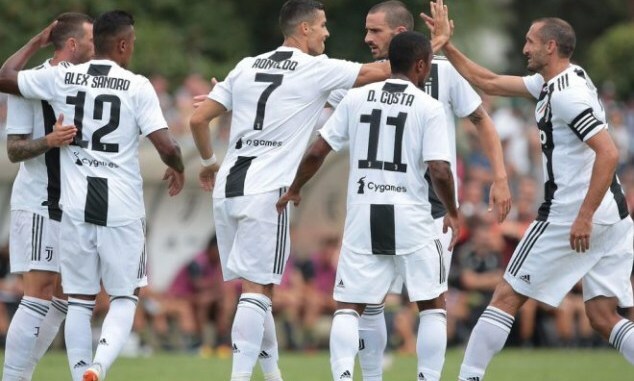 CR7 may have bagged a brace but Juventus got better football traction from the Gonzalo Higuain-Paulo Dybala combination. 4- Liverpool Mean Title Business: Easily the sternest test for Jurgen Klopp’s Anfield renaissance was passed with flying colours when Liverpool toppled Tottenham Hotspur 2-1 in the Premier League’s early kickoff. The form of defensive pair Virgil van Dirk and Joe Gomez has the Anfield faithful in football Nirvana. Liverpool, it seems, have found the defensive solidity to augment their mercurial attack that saw them plunder over 125 goals last season. Manchester City beware. 5- Hazard Is Premier League’s Best Player: Cristiano Ronaldo versus Lionel Messi is the debate that ordinarily dominates player comparisons but I am starting another. Since he joined Chelsea from Lille in 2012, no EPL player has consistently performed at a level as high as Hazard. Not Harry Kane. Not Romelu Lukaku. And most definitely not Mesut Ozil! Only Manchester City pair Sergio Aguero and David Silva come close. Hazard’s hat-trick in Chelsea’s 4-1 victory over Cardiff City took the five-time Premier League champions atop the table and right in the mix for silverware. Maurizio Sarri’s stylish Londoners can challenge City and Liverpool if Hazard stays as motivated as he is right now. 6- Silva Yet Not Delivering Value For Money: Everton manager Marco Silva could find himself in a spot of bother unless he quickly fixes lethargy afflicting the eight-time English champions. When a club makes investment to the magnitude Farhad Moshiri has made in Everton, it expects returns of some definition. Just like in the 1-1 draw with Huddersfield, the Toffees were lackluster in Sunday’s 1-3 home loss to West Ham United. Silva’s reputation is on the line unless he deploys his best team and stems the rot.